Goodreads: Never a doubt. Never a mistake. Always for justice. Never for revenge.She’s the person you hire when you need something fixed—permanently. With a strict set of criteria, she evaluates every request and chooses only a few. No more than one job per country, per year. She will only step in if it’s clear that justice will not be served any other way. Her jobs are completed with skill and precision, and never result in inquiry or police investigation. 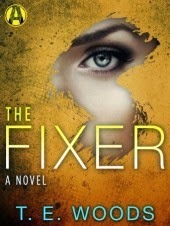 The Fixer is invisible—and quite deadly. . . . In the office of a clinical psychologist in Olympia, Washington, a beautiful young woman is in terrible emotional pain. She puts up walls, tells lies, and seems to speak in riddles, but the doctor is determined to help her heal, despite the fact that she claims to have hurt many people. As their sessions escalate, the psychologist feels compelled to reach out to the police . . . but it might be too late. Kritters Thoughts: A female hitman who has nicknamed herself The Fixer and as you find out in the story she is out to redeem a horrible childhood that still scars her. Unfortunately, her recent job has turned into a little more than her normal job and she is caught up in quite an affair! The first five chapters were short and each had cliff hangers and I was nervous that thing wouldn't connect - thank goodness they did! Although the short chapters continued through the book, I wished that the chapters had more flow to them to allow for an easier read. I couldn't believe who ended up being The Fixer - can't spoil, but it was quite the twist and I am not sure I liked it in the end. The second half of the book redeemed it as it was interesting to watch the detective find the culprit as the readers already knew who dun it. An interesting mystery/thriller that left me wishing it had a little more to it.